Lea Vergine, The Body as Language. Wearing a white slip, paper skirt, and a large paper flower attached to her shoulder, artist Irene Loughlin sits stoically on the ground of a degraded gazebo, holding a black plastic horse staff. 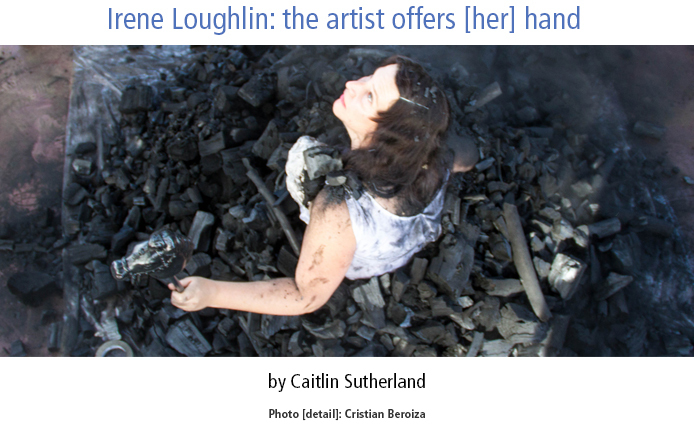 Surrounded by bags of coal, Loughlin invites the audience of her performance to participate, asking them to shovel the surrounding mounds of coal onto her body. Loughlin's performance, titled Carbon de la Pergola Arabe, takes place in Lota, Chile – a traditional coal mining town and home to the former empire of Isadora Goychenchea (of whom the gazebo is named after).